Down Light Hazards are a problem in many homes. The holes for the Down Light are then marked and drilled. Very often one will drill through and unfortunately this will have to be the home of the down light. This could mean the light is under a beam or through a baton. This becomes a problem as the heat generated from a 40 watt or 50 watt Down Light. Can reach up to 250 degrees. In some cases even as much as 320 deg c.
This can also become a problem as the Down Lights that are so close to the timber with the saw dust there can be very close to ignition point. If the Insulation is covering the down Lights it could become a fire hazard. As the heat over the timber will potentially catch on fire as a result of heat being stored. The Insulation wont burn but the heat source so close to timber beams or batons could become a fire risk. Down Light Hazards How To Solve The Problem? Be sure to use the services of experienced Insulation Installers if your home has a number of Down Lights. Step one clean all saw dust away from the batons or beams. Make sure there are no leaves or plastic lying on the Down Lights. Step two use energy save Down Lights they save you money. In fact 13 energy saver Down Lights would use as much energy as one 40 watt Down Light. This will reduce the Down Light Hazard quite substantially. Step three always use a professional installer who is well aware of these types of problems. With well trained staff and full supervision at all times. Down Light Hazards What Could Go Wrong? 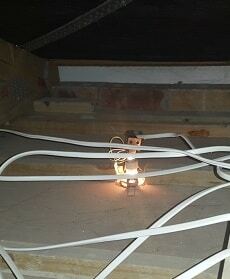 A house were the Down Light is in contact with the timber batons or beams could potentially be a fire hazard. This is on non energy saver types. Cutting the appropriate breathe hole is all that is needed. Homes that are not insulated correctly could also add to this problem. It is a problem that could cost you your valuable home. Make sure you get the right advice from the beginning. Make sure your installer or contractor are fully aware of the issues with down light fittings. 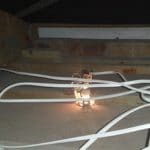 Would Energy Saver Down Lights Be Safe If Covered By Insulation? Energy saver Down Lights most certainly wont cause a fire. The problem comes when you sell the home and the new owner fits 40 or 50 watt globes as the old ones blow. He now unwittingly creates a problem that can have serious consequences. No absolutely not!!! No Insulation should cover a Down Light end of story. If you were away from home and a globe blows and your good wife or the kids go to the local hardware and purchase a 40 or 50 watt bulb that could mistakenly be a disaster. At all times never cover the Down light with Insulation. How To Install Insulation Over The Down Light? All Down lights must have a hole around them with no Insulation covering the Down Light. This will get rid of the Down Light Hazards from Insulation totally. Also when Installing Insulation move all sawdust away from batons or beams were applicable. Does this mean that the insulation can burn? Absolutely not, Insulation products like Aerolite cannot burn. They are roll form Insulation and do not have to have cones over them with small outlets. The insulation can’t blow around in the roof like loose fill blow in type paper insulation. This is a nust because of the fine dust blowing in strong wind. This is not a problem with roll form Insulation. Isotherm Insulation also a roll form Insulation will not need cones to protect it from the down lights and will not burn. As it has a great fire rating and a 30 Year warranty. THE LEGISLATION IS QUITE SIMPLE.. DO NOT COVER DOWN LIGHTS WITH ANY FORM OF INSULATION. Installers of world class Insulation Products Ins South Africa, Cape Town, Western Cape, Gauteng , Bloemfontein, East London Kzn. Light Hazards can cause financial ruin. Down Light Hazards are a simple easy fix in the right hands. Even though Thermal Insulation Products like Isotherm and Aerolite cant burn it is not safe to cover Down Lights as the temperature of the no energy saver down lights of 40 or 50 watts can reach temperatures of 270 to 350 degrees.